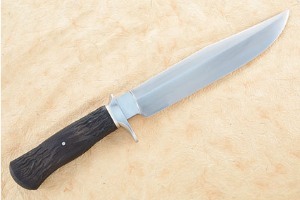 Cutting edge length: 7.80 in. 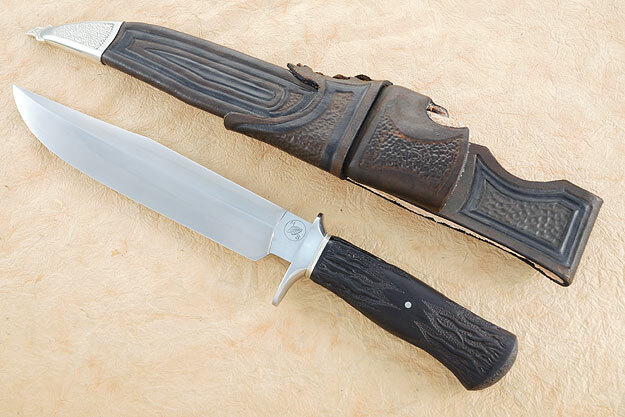 Description: Canadian bladesmith Mark Banfield created this exceptional, hand forged, one-of-a-kind clip point fighter. It has been in a single private collection since it was created in the spring of 2015. It has never been used to cut and by all appearances, it could have been made yesterday. 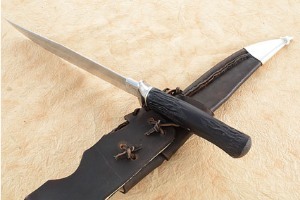 The blade was forged to shape from 1075 carbon steel and differentially heat treated using a traditional Japanese heat treatment technique. The center of the blade is softer and supportive, while the edge and spine are hard to provide a keen, long lasting cutting edge. Prior to quenching, the center of the blade was coated with clay. The insulated the central section provides strength and durability. An 800 grit hand satin finish lends an heirloom quality. The carved handle is exceptional! Dark toned African blackwood is carved and textured with flames on each end. The stainless steel guard is satin finished. A nickel silver spacer is textured to reflect the carving on the wood. 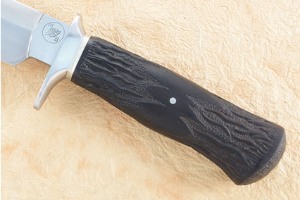 The knife is accompanied by a hand tooled leather sheath with nickel silver fittings. 0.296875 0.0546875 296.875 54.6875 Trailer Started. 0.46875 0.171875 468.75 171.875 Trailer Completed.